Life habit: lichenized Thallus: crustose, areolate, without elongated lobes; prothallus: absent surface: yellowish orange, smooth, without asexual propagules Apothecia: adnate, 0.2-0.7 mm in diam., lecanorine disc: orange, flat, epruinose margin: persistent, flush; thalline margin absent; proper margin visible, concolorous with disc parathecium: irregular hyphae, exciple below hypothecium with irregular hyphae epihymenium: golden, K+ red hymenium: hyaline, 55-70 µm tall paraphyses: not swollen or 1-2 tip cells slightly swollen, with some branching or frequently branched; subhymenium hyaline asci: cylindrical, 8-spored ascospores: hyaline, 2 locules, ellipsoid, 12.5-15 x 5.5-7 µm, isthmus 3-4 µm, spore end wall thin Pycnidia: not observed Spot tests: apothecial margin K+ red; thallus K+ red Secondary metabolites: unidentified anthraquinones. Substrate and ecology: on wood or bark World distribution: southwestern North America Sonoran distribution: Arizona and Sonora. Notes: Caloplaca durietzii has an areolate yellow-orange thallus of small convex areoles or verrucae and apothecia with dark orange discs. 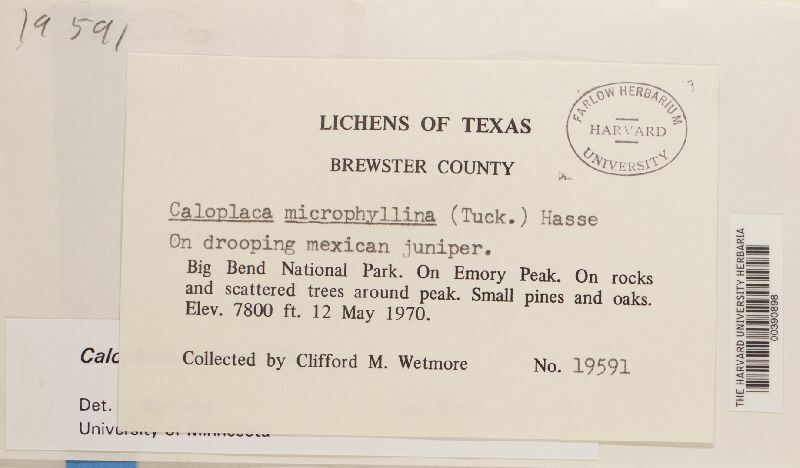 The original description mentions small verrucae between the apothecia and compares it with C. pyracea. It is uncertain what this species really is at this time and it needs further study. Caloplaca microphyllina is somewhat similar but has soredia. Species 5 has globose isidia and no soredia.